Rachel Maddow did a brilliant job during her show on Friday, showing outtakes of Matthew Whitaker guzzling water during his appearance before the House Judiciary Committee. This was no small amount of water. 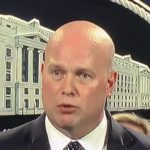 At one point Whitaker had three open bottles going at once, and he appeared to drink perhaps twenty bottles of water during his six hours of answering questions. This was oddly reminiscent of Brett Kavanaugh’s water drinking during his Senate confirmation hearings last year. In fact, there was another similarity between Kavanaugh’s performance and Whitaker’s performance. Both men’s combative nature was surprising, inappropriate for the occassion, and seemingly, at least somewhat out of character. We found out, thanks to MSNBC reporting from Ari Melber, that Brett Kavanaugh had been coached by the White House before his hearing. Matt Whitaker had reportedly been practicing too. Many people speculated that Trump specifically told Kavanaugh to come out swinging and get angry during his questioning, and Trump was very happy with Kavanaugh’s strange performance. Trump also seems to be pleased with Whitaker’s combative performance. The question these similarities raise for me is what in the world makes a person unusually combative and guzzle unusually large amounts of water? Does Donald Trump merely like picking people for high office who become really thirsty and prone to fits of rage whenever they testify, or is there something more going on here we should know about? This pattern seems too oddly specific to be ignored.